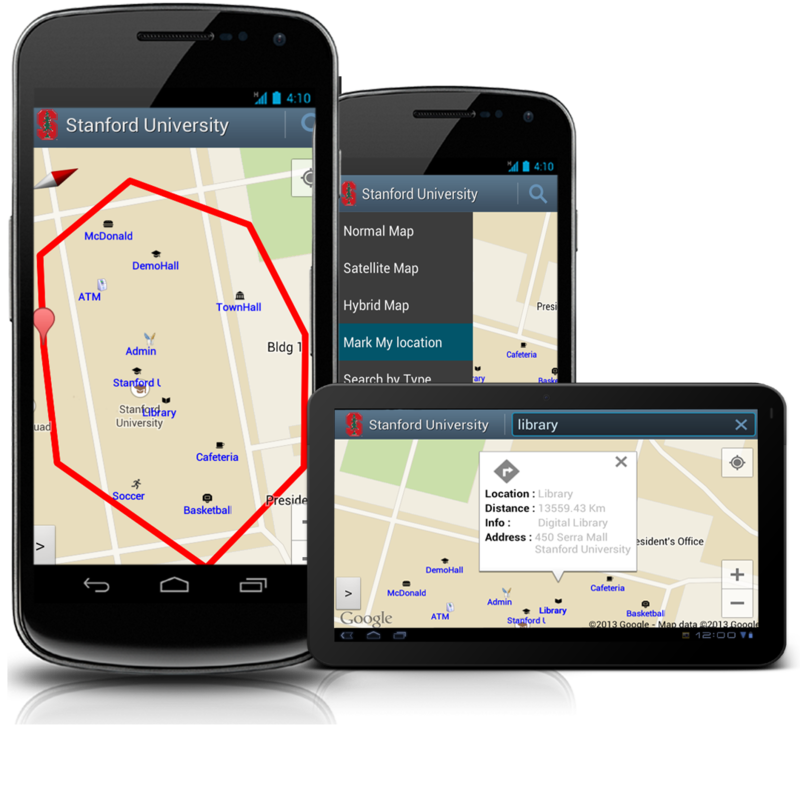 Make your own multiple map applications which affect all mapping capabilities on Google map. Select an area and mark complete area with all existing locations. Add a boundary to the selected area to differentiate from other regions. Create an app and generate application from your android device using own key within few seconds. The key which is created using user Gmail account, it generates a unique key for multiple user accounts. Generated key is different from user to user. 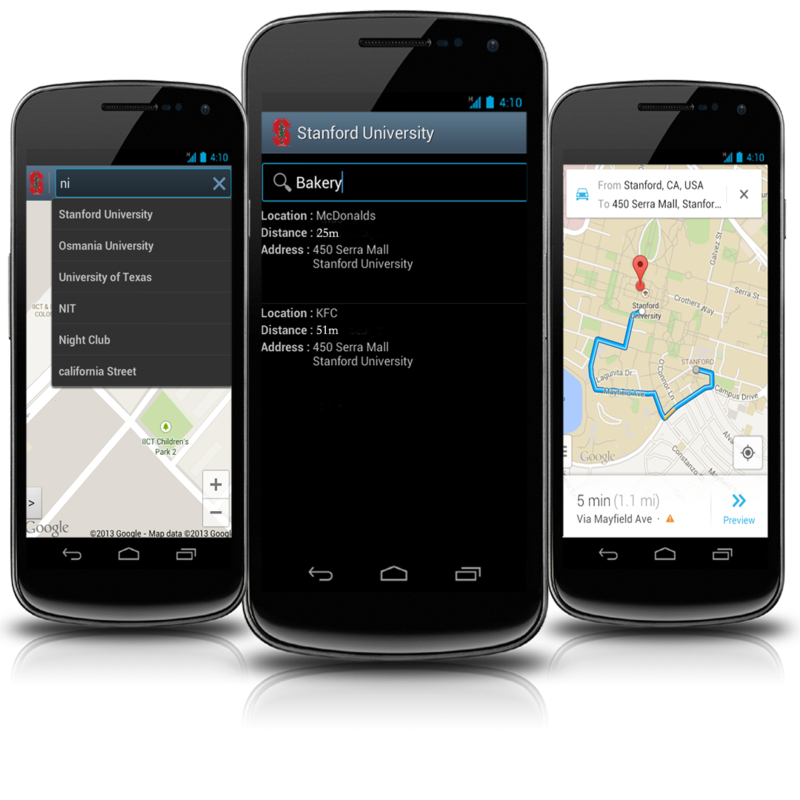 Create multiple applications to locate and build your places like university, Company, Colony, Recreation Locations and Give flexible name which suits best to the app. Using this app you can make your own map, pack it as an application from your mobile which can also distribute in play store. 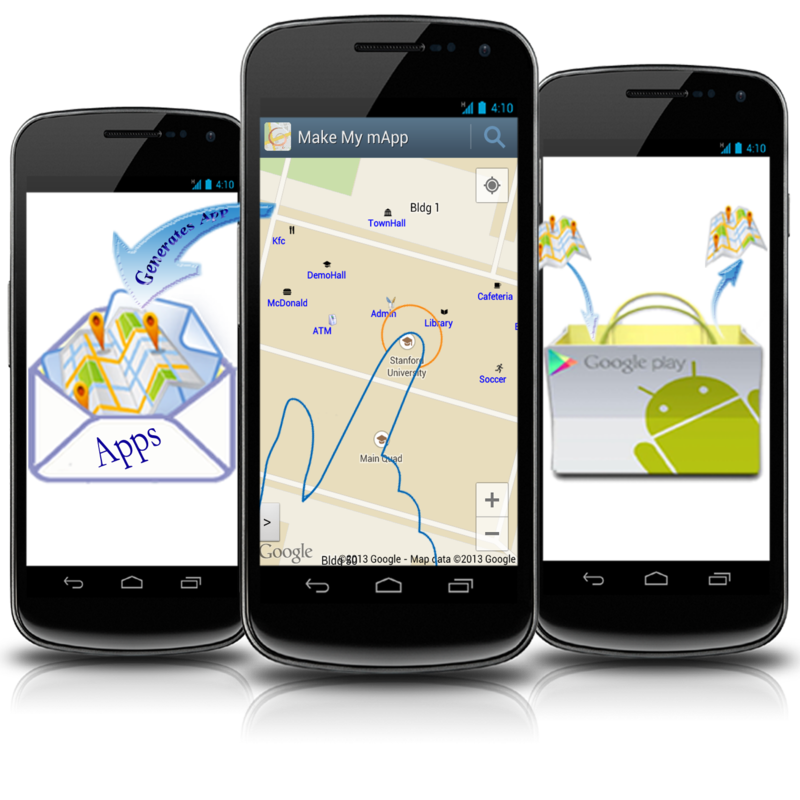 This app is created by using "Make My mApp" android application powered by 'Geek Labs'. Working with Google Maps V2. Can find User current location. Map Rotation as Google map provides it. Find details of location like address and distance on long click. Get Details of the marked location. Add Location details for indicating marker at that particular location . Directions for different locations by supporting Google maps application. Rename or delete the markers which are available in map/app. It is flexible to add the location type category. Can perform multiple list of actions on map and list of items in slide out home page of maps. Trace your location based on locations which are marked on map or Can search by category. Choose a location from Multiple places which arrives on map of same category . Generate Maps for specific areas. Build own maps with unique name. Authentication for generating secured APK files. Generate maps with own key Store. List of apps and its actions. Make My Map to build map for particular area for ex: RFC. It is map for particular area. Where you can get very minute level map future enhancement to make street view and user life will be very simple to travel by using this application. End user can access this application same as other applications in their mobile. Network provider / GPS provider is must to use the application. MMM plays multiple roles that it is useful for map creator and map user (end user).As a map creator user can mark multiple places with in the map for particular areas and generate the map. As a user (end user) use this app while travelling with in the particular area of generated map or as a Google maps. What is Make My mApp? MMM is an application that was released by Geek Labs for Android on September 27th 2013. Why is Make My mApp? This app can store locations which you havemarked and exist until you remove or delete the marker. How use Make My mApp? To test the application Choose/ Select/ Click the generated apk file which is created by your appname just. a) After copying the SHA-1 key click on Instructions b) Then go through the instructions displayed and click on api console URL https://code.google.com/apis/console/ c) Login to API console https://code.google.com/apis/console/ d) After login click on Google apis which is located at top left corner. e) Click on "Create project" then go to services page and enable or activateGoogle Maps Android API v2 service. f) Accept the terms and conditions license agreement. MMM is an application that was released by Geek Labs for Android on September 27th 2013. The GMM application has been featured on the Android operating system was powered byGoogle Maps with many customizations (like info window, marking). This application usedown mapping system on Google map with data provided by a well known user or admin. MMM has many of the features that are in their Android map application, including turn-by-turnnavigation which you can get from MAPS application, Search for Location information Based onName and Based on Category. The application's user interface has been complete user friendly. Once the application is created and generated you can use it as per your requirementThis application is most useful for the specific particular place or areaOnce save all the locations by marking various existing locations on the map with the markersLocation can be marked with all enough details like location name, a brief description aboutlocation and also you can able to mention its category for example: Airport, Company etc…Once you have marked the location you will get its related category type icon with location nameThis application can be used by users who travel or visit to new places. Have you and your friends faced a problem earlier, when you visited the new place? So, here isthe application which overcomes your first entry when you visit to new place Save a location you are at, visited or special to you. This app can store locations which you havemarked and exist until you remove or delete the marker.Search for a place which is marked and also know its address along with distance from yourcurrent/present location.This application can be used by users who travel or visit to new places. 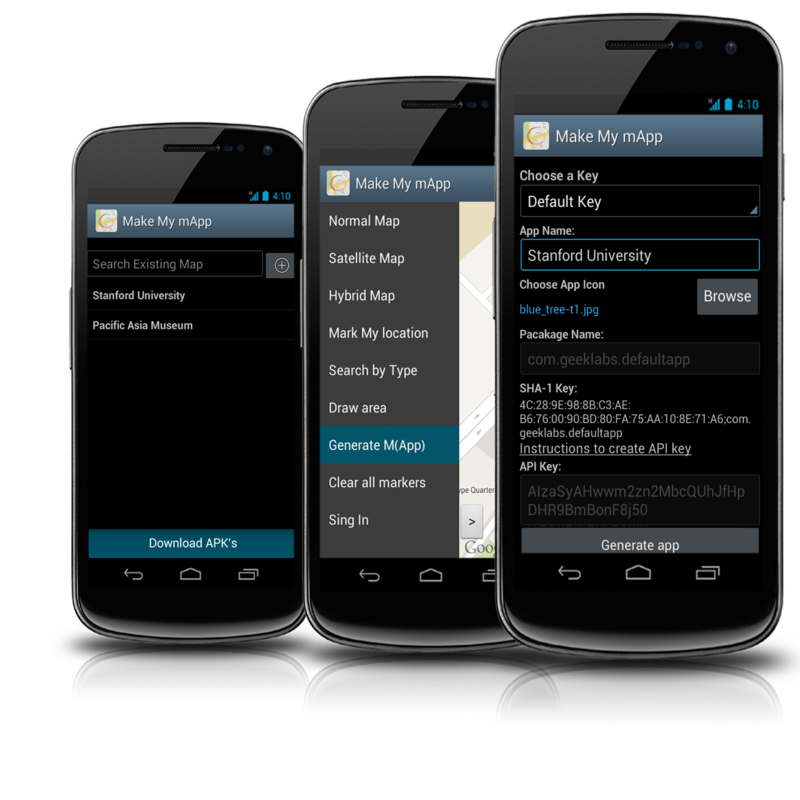 How to use Make My mApp? Mapping the Google map is the process of designing the Local area (or specific area) map, byimplementing /adding markers along with names which looks fantastic and completely differentfrom Google markers. Almost these markers were best suitable for its profession. Other than thisuser can able to get many more details of locations and also easily understandable. Can getdirections using Google maps. Should able to get information about address and distance of locations, all over the world.Getting address is helpful to mark the location in exact place and also can able decide ourlocation to visit based on the distance. To test the application Choose/ Select/ Click the generated apk file which is created by your appname just follow the steps to install. Now it is installed in your device. Can generate the application n number of times to test it but no need to generateapplication for each and every change. Application will save all your data for everyupdate, without generating an app. To test the application in various devices or in same device it is must to generate a file User can only use the details of the locations which are given by admin but there is no way toperform an action on generated markers. User can update and delete which is created by them. GMM is the application where a person plays an admin role can also become a member inGoogle play store that is by generating multiple maps using GMM application and placing themin play store. Just should have knowledge of (what is package name, SHA-1 key and Google mapsAPI Key, Google API Console which is also available in the rest of document). Packing a map as a new application with own keys generated by using Gmail or g+ account which stores all your application data in the form of a android file. File can also be able to distribute to android market(Google play store), where the end user can upload a file and use. Generated file applications is stored in SD card as well as in the server. Using your account details can download the files which you have created. Generated file applies all the rules same as the real android application file. The generated file can also be able to upload in play store placing all terms and conditions. Multiple applications generated with the Same Key does not allow user to keep the app in play store. Spot your position by indicating marker at your current position. Mark your locations in the selected area on map. Applied Flexible marking capabilities like mark your location in exact position, Add names to your location, Brief info about location, mention its category. Rename or edit the location which is marked, Delete the location from the map permanently as the place is not exists. Providing all map capabilities for specific location to mark and to draw a region with boundary by placing the polygon on map which behaves or differentiates from other regions. Search for Locations based on category like Restaurants, ATMs, and choose nearest place from your presence based on distance. Search local places based on location names which are marked in the area and get information of that location. Google maps turn by turn navigation from your position using GPS get directions from where you are to where you want to go using Google maps application. Enable GPS to know your current location and to get details of the places. GPS provides info like Distance and address based on your current position. Tired of searching for your location on map? Or Find my current location? How to mark my current location? Swipe or Drag on the map view (for slide out) from left corner or click menu option choose “mark my location” and name it. Then the marker is shown on map. How to mark other location which is not my current position? Select the location and long tap at that exact point then on click on the marker icon Fill the details of the location click save to add marker on the map. How to know the information of marked location? How to get the direction from my location to the selected location? How to change the map type? Change the map view by changing types which is mentioned in slide out. How to search for a location? Click search Icon which is in Title bar (top right corner). Can search all locations which is marked on map Search Location based on category, by selecting search by type in slide out. Select one of the location types from dropdown list. Displays all the locations . How to rename or edit the location information? On click on Edit and delete option in info window, change the name and save it . On click on Add option which exist top right corner, create application . After clicking on generate app in slide out choose select key block then create new key option. Create a key and click finish button after entering all the required fields in the form . What is create new key and what is the use of it? By using the key (select the key which is created) generate an application Can use the same key for multiple applications but cannot upload it to play store . What is mean by key or key store? Based on the given user details create a key (SHA-1 key and etc) which stores in the Key store. What is test key and what is use of it? Test key is used to generate application for the first time, it is just for reference. But generating an application using Test key cannot publish it to play store. Test key is used only once . Why I should create key? To generate application using your own key either it may be your organization key or your own key. Create or generating application with the user created key can able to publish the app in play store . How to download the generated applications? Click download app in home page. Select the file from the list to download. File is stored in SD card. But there is no way to perform changes and generate application Once the application is generated you cannot change the file. Instead of it you can generate other file by choosing the appropriate application from the list of apps which exists in home page . How to generate an application? Choose generate app in slide out, Select the test key or create new key , Give the application name, Choose icon (will not allow the images which are from internet only allowed the images which are in gallery), Enter the package (By following the rules), Generates SHA-1 key, Copy the key and generate API key How to generate API key , Then copy the generated API key in its respective field, Click generate app button, Application generates and stores in your SD card, Install the application in the device or other to test. Why I need to login into Gmail account? Why it is mandatory to enter package name? How to copy SHA-1 key? What is mean by API key? API key is generated using the SHA-1 key and package name of the application, which is also a unique for each key, Package name must match with the application package . What is mean by Services and How to enable it? After login click on Google apis which is located at top left corner. Click on "Create project" then go to services page and enable or activateGoogle Maps Android API v2 service. Accept the terms and conditions license agreement. To open application page long click on home button and choose the application or click on back button until the form/page displays to paste an API key. How to delete or rename the application after creating? What is the use of Download app? After download app how to host the application to play store? After generating the application am unable to install the app in mobile? After Installing the generated app am unable to see map? There is a problem in generating an API key. Check whether the correct format of SHA-1 key and package name is used.Generate an API key and copy and paste the key in appropriate fields. There might be problem with network and GPS. Is it possible to generate multiple applications with same key? Is it necessary to generate key for each application? How to run the application in background? How to open the last activity/page I visit? How to switch between draw boundary and map mode? How can I login with other user account? After application download am unable to see map? There is a problem in generating an API key. Check whether the correct format of SHA-1 key and package name is used. Generate an API key and copy and paste the key in appropriate fields. How to host the same application in play store as different versions? Can generate same app with same key multiple times?